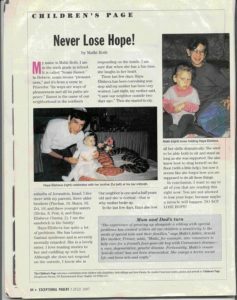 In July 1997, the American magazine “Exceptional Parent”, which addresses the needs of families with children who have disabilities, published a letter which Malki wrote to them about her feelings for her severely disabled sister. My name is Malki Roth. I am in the sixth grade in school. It is called “Noam Ramot.” In Hebrew, noam means “pleasantness” and it’s from a verse in Proverbs: “It’s ways are ways of pleasantness and all its paths are peace.” Ramot is the name of our neighborhood in the northern suburbs of Jerusalem, Israel. I live there with my parents, three older brothers (Pinchas, 19; Shaya, 16; Zvi, 14) and three younger sisters (Rivka, 8; Pesi, 4 and Haya-Elisheva Charna, 2). I am the sandwich in the family! Haya-Elisheva has quite a lot of problems. She has Lennox-Gastaut syndrome and is severely mentally retarded. She is a lovely sister. I love reading stories to her and cuddling up with her. Although she does not respond on the outside, I know she is responding on the inside. I am sure that when she has a fun time she laughs in her heart. These last few days Haya-Elisheva has been convulsing non-stop and my mother has been very worried. Last night, my mother said “I saw our neighbor outside two days ago” then she started to cry. Our neighbor is one and a half years old and she is normal-that is why my mother broke up. In the last few days, Haya also lost her skills dramatically. She used to be able to both sit and stand as long as she was supported. She also knew how to drag herself on the floor (with a little help), but now it seems like she forgot how you are supposed to do all these things. In conclusion, I want to say to all of you that are reading this right now: You are not allowed to lose hope, because maybe a miracle will happen. DO NOT LOSE HOPE. 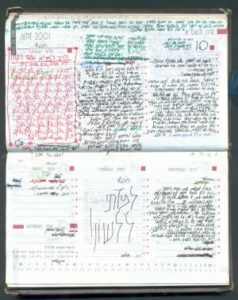 In June 2007, Malki’s mother, Frimet Roth, spoke about Malki’s diary at a concert in her memory at the Jerusalem Music Conservatory.  A few weeks ago Rutka Laskier’s diary was published. Ruth was a 14 year old girl living in the Warsaw ghetto until she was murdered in Auschwitz. As with Anna Frank, her writing is a mix of regular thoughts for a teenage girl, and her response to the horrors around her. Malki also had a diary. She wrote it during the last 10 months of her life, and as did Anna + Rutka, she gives a detailed account of her everyday life. School, “Ezra” youth group, flute lessons-together with the details of every terror attack. Every loss of a Jewish soul hurt her personally, or in the words of her diary “I experience it myself”. It was always clear to us that Malki was unique in her sensitivity, her care for others, and her appreciation of even the smallest pleasures in her short life, lost this diary reinforces these characteristics. With time, our pain and longing for Malki only increases. It is difficult to live without her. The fact that she is remembered here every year at the music conservatory gives us some comfort. While many of us have already forgotten those years of terror that began September 2000 and wiped out the memory of so many children like Malki who were murdered by our enemies, here at least she is remembered.